The Bouvardia is know by several names, one of the most common being the firecracker bush. 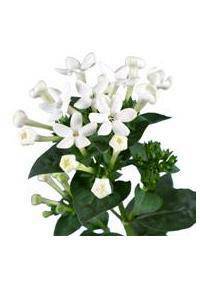 It is sometimes called the jasmine plant, although this is not actually the same thing. Some gardeners and cultivators refer to the Bouvardia as scarlet trumpetilla. Its delicate fragrance makes it a popular choice for many gardens. It can be grown in many soil conditions as well as in a container. Some may also choose to use it in bouquets at home or from a florist. B. longiflora is a subtropical and native to North and South America. It is primarily found in Mexico, New Mexico, Arizona and Texas. These plants do well outdoors in hotter climates. Most subspecies produce flowers in shades of red and pink. Some may appear a lighter pink or in shades of white or off-white. Bicolor flowers have also been cultivated in some of these species. B. ternifolia is another of the more commonly found garden species. It can grow between two and four feet at its maturity. The blossoms are often two inches long each and appear in clusters. This species attracts hummingbirds and provides them with nectar. It is a popular choice for creating a butterfly and bird attraction. For this reason, many plant it near a sunny window so that they can watch the birds come by. Full sunlight is essential to create a thriving Bouvardia plant. The brightest possible sun exposure should always be used for these plants. If there are no other options, they can grow in partial sun or light shade. Use a water soluble fertilizer on a regular basis for this bloom. The fertilizer should never be poured directly over the blossoms, and some gardeners may also wish to avoid the leaves when watering with fertilizer. Watering should be thorough as well drained soil is crucial to plants. Soil should never be allowed to stay wet for long or dry out fully. The soil may need to be conditioned prior to planting for drainage. The plant is highly susceptible to mealy bugs as well as scales. Insecticidal soap is recommended to combat this, but use caution. Too much at a time can cause damage to the leaves or the blooms. Some choose to add these to containers for patio or deck decoration. Others may add them to a sun-loving floral garden along a house. They are also a popular addition to a garden intended for cut blooms. The Bouvardia’s star like appearance makes these a top choice for bouquets. They can be combined with other misty or dreamy appearing blooms. This may include statice or other feminine looking flower species. Many florists and flower enthusiasts alike seek Bouvardias for many assortments of flower bouquets and arrangements for occasions ranging from anniversary flowers and congratulations, all the way to sympathies. Flower establishments in Pasadena, CA, Montgomery, AL, Vista, CA, Columbia, MO, and West Palm Beach, FL make demands for these most often, but you can order these flowers with delivery from all over. The rich pink color is often a symbol for feminine nature as well. Some are available in salmon, peach, creating more color choices. This can change the meaning of the flowers somewhat when necessary. It is often used to represent enthusiasm about many different things. It can represent enthusiasm about a new lover or a best friend. It may also be used to show excitement about a project or change. Florists often use these for cheerful and sunny floral arrangements. They may also use them to create exotic mixtures for special events. In some areas, Bouvardia is considered a rare and exotic flower.